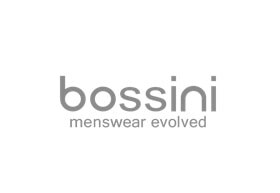 As a company focused on producing high quality menswear, Bossini has become a massive part of high fashion culture and a well known market pioneer. Bossini was first introduced as a classic men's business wear line in the early 1990's. Since then they have extended their range to casual wear, knitwear, formal wear & various fashion accessories. Their ongoing partnership with the world's finest manufacturers enable them to produce timeless garments whilst maintaining prices that fit the budget of today's value-conscious customer, this is essential to the growth and success of Bossini.